If you’re a college or high school student looking to earn better grades without studying more then you’re in the right place. Score grades near the top of your class. Finish studying in less time than it takes the average student to sit down to start studying. Spend more time with those you care about. Beat your teachers at their own game by learning the tricks they would never tell you. Realize your potential to be AWESOME. It sounds pretty cool, right? But who the hell am I to make these kinds of claims? Well… you can learn a bit about me and Smart Student Secrets here. Don’t take our word for this stuff! Some of the biggest blogs in the world love to share our stuff. Wondering what the first step is? Well, here’s the first thing you should do. 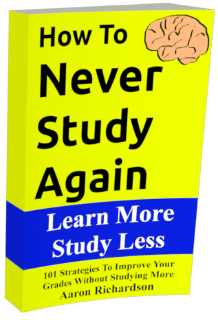 The most powerful study strategies intended to those looking to be a zenned out guru when it comes to studying. Access to pages of unique and exclusive content that’s not intended for the general public. A wealth of the most personal and honest study, school, and life advice you’ll find. Notifications when you can access the Smart Student Secrets books free on Amazon. After signing up you can access our members only area here. By the way… I absolutely hate spam so don’t expect any of that from me. Find the goal you’re looking to achieve and you can explore some of the blog’s most popular articles on the subject. Q/A – Is This A Good Major? Are you interested in following along with the blog’s social accounts? Have something else to say? Think we need some other social account? Go to our Contact page and send a message to Kay.